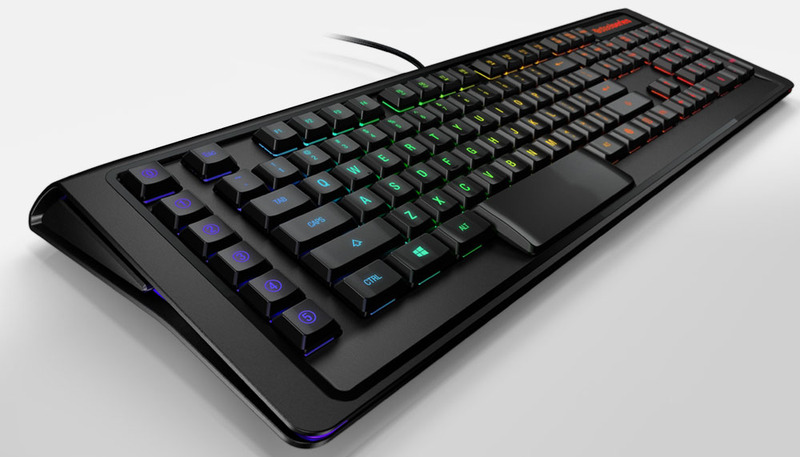 SteelSeries has opted to use custom manufactured switches on the keyboard, tweaking the performance of other mass market mechanical keys for something they have a little more control over. What you get is a switch with no fancy names but fancy features like 1.5MM Actuation with 45CN force and a centered LED for more impressive lighting. How it behaves and feels is quite a bit different than the other keyboards I compared it against. While the Razer Black Widow provided and “punch” feeling on every click, like you were pushing a hole through a piece of paper, the M800 feels more like the paper is pushing back. It’s not a mushy feeling like you’d get with a typical membrane keyboard, but almost a rubberband like effect. The G910 sat firmly between these two in terms of feel. The keyboard itself is constructed extremely well. It’s solid, with heavy duty rubber feet that stop it from moving on any desk. There’s not even a “kick-stand” option to raise the angle, instead there are larger heavy duty rubber feet that can be interchanged. You'll only find a few extra buttons on the keyboard, and that’s OK. You get six macro keys capable of recording sequences and two USB 2.0 ports on the back. 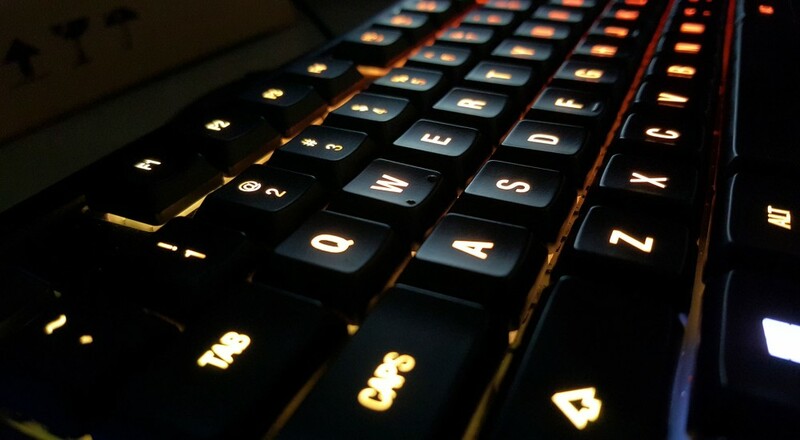 The keyboard is lit beautifully with individual key LEDs for as many color combinations and patterns as your heart desires. I absolutely love the Reactive Key mode, which lights up each key to a different color when pressed and then slowly fades it back to the original color. The software is the same Steel Series Engine 3 software used by its other products. It’s cleanly designed, offers tons of flexibility, and like the keyboard - offers no bloat. If you were turned off by features like heatmaps, speed tests, community game profiles, etc - then this is perfect. It’s exactly what you need in a clean and easy to use piece of software. There are tons of options for customizing the illumination on the keyboard itself and the Macro Editor is by far the most detailed and comprehensive I’ve seen. Recording the macros can be tweaked with alternate key press types, adding MS delays, and chaining with other keys and macros. It’s extremely powerful. In terms of actual performance the keyboard showed no issues during play with games like Counter-Strike: Global Offensive, DOTA 2, Overture, Diablo 3 and many others performing great. I never felt like I got tripped up doing any complex finger dance. I set up macros for things like buy groups in Counter-Strike and chains in DOTA 2. It took a bit of memorization to remember what key does what, but overall I liked it. I felt it gave me the edge. You can easily save macro profiles in the software and switch as needed. If I have a gripe with the keyboard it’s that the keys feel a little cramped for me. I’m not sure what it is, but I definitely felt fatigue when using it. During my previous tests comparing the mechanical keys and typing; the “speed” was just slightly behind that in terms of the switch performance, but honestly, it’s negligible for the average gamer. At $200 the Apex M800 is one of the most expensive mechanical keyboards on the market that are geared towards gamers. You can feel that in the construction of the keyboard itself, this is a keyboard that could easily go from LAN party to LAN party. If you’re a fan of SteelSeries products, and are already using one of their mice or headsets I’d say the choice is easy when choosing a new mechanical keyboard - pick up the Apex M800 and you won’t be disappointed.